Here is a card I did for the Eyelet Outlet blog. I used a die to cut the ornament of some super shiny WR Memory Keepers paper. I added the large Eyelet Outlet Jewel Brad on top as the holder. Loving the velvet paper too! 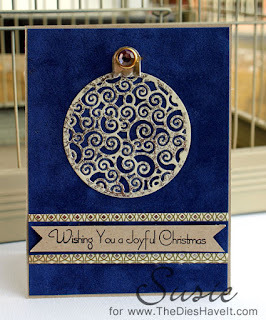 Be sure to check out all the holiday cards on the Eyelet Outlet blog today. SO much beauty! Very pretty. I love the deep blue.